Apr 30, 2009 Br. Lawrence Mary M.I.C.M., Tert. I’m sure that what I am about to say is “old hat” to everyone in this audience of fellow Third Order members and friends of St. Benedict Center. My wife and I do nothing very special. In fact, I’m afraid I won’t be able to offer any wonderful and riveting tales of stunning successes. Some small ones, but no great and amazing feats of courage as great and brave crusaders. My talk will simply summarize about twenty-five years of plugging along, trying to remain faithful to the St. Benedict Center crusade and quietly living as Third Order members without making too much fuss. Instead of being a tale of how St. George slays the Dragon, our story will be more about how George bathes, brushes his teeth, sharpens his sword, rides his horse and cleans the stable. Even after giving you this caveat, I’m afraid I will not be able to convey the reality of our daily lives as Third Order members. If you benefit in any way, I assure you that it is entirely the work of Our Lady-just like everything else my wife and I have been able to do during our long association with the Center. The crusade of the Slaves of the Immaculate Heart of Mary is essentially very simple: Our personal sanctification, the defense of all of the dogmas of the Faith, in particular Extra Ecclesiam nulla salus, and the conversion of America. Although the main elements of the crusade are familiar, there is more to being a Third Order member than reciting them on cue. I’d like to begin with some general principles that have guided our apostolate as Third Order members. Although my wife and I work together as Third Order members, we work differently. I will not describe how my wife operates in this apostolate. Even though we share the same general principles, she takes an entirely different approach. Nor will I describe how we work together in practice. Often we play “good cop, bad cop.” At certain times, we also involve third parties to assist us. I will limit my talk to my view of the work we do together. On the other hand, we both believe that having a clearly defined set of general principles is extremely important. They allow for maximum flexibility in practice, while remaining faithful to the purpose of the Order. Without them, it’s easy to become either too rigid or too lax. Both of these extreme positions are very harmful to the crusade. First, this is Our Lady’s work, not our work. We need to be prepared for disappointments and problems-many of them. When they come-as they most assuredly will-we must remember that Our Lady is in charge. We must remember to benefit from these disappointments and offer them up to Our Lady to do with as she pleases. In fact, everything must be offered to her to do with as she pleases. We also must bear in mind that, we often play a very small role in a much greater process that is being directed by Our Lord and His Blessed Mother. Even though we are ready and willing to do whatever Our Lady asks of us, we rarely see the end result-or any results for that matter. Second, we receive the sacraments as often as possible. We do our best to get to confession every week. We found that we can hope to accomplish very little if we don’t remain in the state of Sanctifying Grace. When a person becomes a Third Order member he must be ready to “stand in justice and in fear and prepare his soul for temptation.” Without the help of the Sacraments, we may be headed for personal disaster. As Third Order members, our souls are in greater jeopardy because the devil will do everything possible to stop us. Third, in addition to the daily Rosary, constant prayer is essential. Our Lady is wonderfully generous. When we appeal frequently to her, she is even more so. If we are going about our work as Third Order members with any success at all, the devil is not going to sit by idly twiddling his claws. We must be prepared for frequent diabolical attacks. They will come from the most unexpected quarters and, often, from our closest friends and associates. Often, the attacks will be intense and personal. Only by constant prayer and the help of Our Lady can we hope to survive spiritually and avoid discouragement. At times like this it’s good to recall the words of St. John Climacus, “War against us is proof that we are making war.” Although I will not relate any of these sorts of experiences in this talk, rest assured that we have had plenty of them! Fourth, we have always tried to remain docile to the directives of Brother Francis and the St. Benedict Center. We do everything with the intent of following “the mind” of the Center and do our best to avoid being a cause for scandal to the crusade. As Brother Francis said to me, more harm is done to the crusade by well-meaning but misguided “friends” then by its avowed enemies. When in doubt about anything, we always consult with Brother Francis, Brother André or Sister Marie Thérèse. One of the things that we have learned is to try to keep secondary matters secondary. Because the modern Church leadership is weak at best, secondary issues have a greater tendency to be divisive. The big question that can be a stumbling block if not handled properly is the so-called “Baptism of Desire.” When we first became acquainted with the Center, I raised the question with Brother Francis. I believed in the “baptisms of desire and blood” because it was what I was taught in grade school. Brother Francis’ response was that I could hold this opinion as long as I accepted the Church’s position that Baptism by water is necessary for salvation and that there is no salvation outside of the Church. Even though I approached Brother several times for clarifications, I was satisfied by his answer. In those early days of my association with the Center, I was at least convinced that they didn’t go “overboard” as I had been warned by several of my friends. Frankly, after that, I didn’t think too much about it. It wasn’t until several years later, when the issue arose in our family and I was forced to research it independently, that I saw the error in my position and accepted the Center’s opinion as the correct one. Brother had kept the discussion in its place as a secondary matter and emphasized the defined dogma of Extra Ecclesiam nulla salus. He allowed me to hold my opinion, while he gently explained the reasons that the Center holds theirs. Since then, I have tried to handle others who profess the “Baptism of Desire” the way Brother Francis handled me. This approach has neutralized or won over many of the people who would have otherwise remained hostile towards the St. Benedict Center. Fifth, over the years, my wife and I have come to realize that flexibility in approach is extremely important. Although I will mention some general guidelines and techniques later in this talk, the real work is one-on-one and must be tailored to each individual. For those of you who have had any professional sales training, this is where those selling techniques can come in very handy. We do follow one general guideline in our approach. If we believe that our contact with an individual will be brief or if there is some other urgency, we are more direct than if we will have the opportunity to develop a long-term relationship. Sixth, we continually read and learn more about the Faith so that we can give better answers to questions and objections. As some of you may know, we have been involved in the St. Augustine Institute’s Circle of Study program for more than twenty-five years. It is impossible to express how helpful this has been to our apostolate. The circle meetings offer much more than dry classes on the finer points of philosophy and theology. We usually base each on one of the wonderful tapes offered by the Center. These are always edifying and instructive. During the meetings, we have the opportunity to discuss various real-life problems and situations in a friendly environment. We gather resources and facts for discussions with potential converts. The circle members share the results of these discussions and get ideas for new approaches, answers to challenging questions, and offer support when the going gets difficult or the problems become too personal. In a sense, it is similar to attending a conference like the one you are at today–several times per month, rather than once per year. Regular circle meetings offer a powerful means of support and encouragement in a world that is increasingly hostile to our work as Third Order members. If you do not have a study group nearby, you really should start one. If you are married, you can begin with you and your spouse, assuming he or she is so inclined. If this is not possible, you can call the Center and ask to be put into contact with Center friends who live in the area. Pray to Our Lady to help put you in contact with other like-minded Catholics. Several years ago we moved to a new area of Wisconsin and were forced to leave our veteran Circle group. I contacted the Center and received a list of people in the area who were friendly towards the crusade. I sent these folks a letter announcing that we were interested in starting a new Circle of Study group and asked if they would be interested in joining. From that mailing, Our Lady gave us a group of vibrant and enthusiastic traditional Catholics. It took several years, but we completed Brother Francis’ complete course in philosophy. Our Lady has been more than generous! Seventh, we have always tried to keep our family first. From early on, Brother Francis warned me about this. He said that one of the devil’s main attacks is on the family. He said that it is essential to always bear in mind that, although we must hold and defend the dogmas of the Faith, we must never get so active that we neglect our family. The simple fact of holding and professing the foundational dogma of “no salvation outside the Church” will cause enough difficulty. 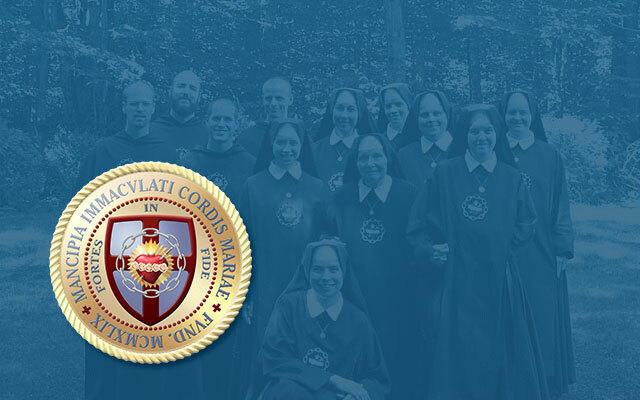 Over the years, we have seen many people get very excited about the dogma and St. Benedict Center and they wanted to devote all of their time and resources to fighting the crusade. Unfortunately, we have watched some of them get out of balance and lose the people closest to them while they were determined to “save the world.” Balance is one of the hallmarks of living the life of a Third Order member in the world. Now that I’ve enumerated the principles that guide us in our Third Order apostolate, I will describe some techniques we have found to be successful. Again, these are general techniques that can open the door to one-on-one encounters, and may offer the occasion of Grace for various individuals. Experienced Third Order members will find nothing new in these methods. Remember, we’re describing how St. George cleans the barn, not how he slays the Dragon. I’ll stress again that Our Lady does the real work. We just try to assist without getting in the way. When we plan any celebration, we try to make it an occasion that will promote the traditional Faith, the Tridentine Mass, one or more of the sacraments, or provide a good example for some aspect of Catholic life. For example, several years ago my wife and I decided to celebrate our thirtieth wedding anniversary. We contacted the priest at our local traditional chapel and asked him if we could renew our wedding vows before the last Mass on Sunday. We arranged to use the downstairs hall for a meal and celebration to follow immediately after the Mass. We not only sent out invitations to our friends and relatives, we also asked the priest to invite everyone who attended the Mass to join us. In addition to the normal list of friends and relatives, we specifically invited some people whom we wished to influence. The list included relatives, old friends and acquaintances who were non-Catholics, fallen-away Catholics, agnostics, etc. In short, many of the people were anything but traditional Catholics. Our purpose was to give them a positive Catholic experience at a Tridentine Mass and, God-willing, an occasion for Grace. Our celebration went off without a hitch. People had a good time. And, as with all good times, the event passed all too quickly. Everything went smoothly and there were no unusual happenings. The next day, we received a phone call from a Protestant friend whom we had not seen for many years prior to the party. He was in tears. He said he had been deeply moved by the Mass and the solemnity of the event. He declared he was going to become a Catholic — a traditional Catholic. Shortly thereafter, not only he, but his wife also began convert instructions. Several months later they were formally received into the One True Church. After his conversion, I urged him to begin to pray and sacrifice for the conversion of the rest of his family. To encourage him, I revealed a secret. Imagine his surprise, when I told him that I had prayed for his conversion every day for the previous fifteen years. Although her timetable may not be the same as ours, Our Lady is very generous! Since then, our friends have both eagerly learned more about the Faith. They are active, hard-working members of the local Traditional Chapel. He and I speak by phone frequently and we share a friendship which has become a true blessing for both of us. Although he and his wife unconditionally accept the dogma Extra Ecclesiam nulla salus, I am still working on him, slowly but surely, to become a friend of the Center. Like I said before, this is Our Lady’s work and her timetable is often quite different from ours. When my wife and I were young, we left the Church. We stayed away for about fifteen years. In 1981, through the Grace of God, we returned. Since then, we have gone about collecting and preserving Catholic religious items. In fact, our home is filled with religious artifacts-paintings and statues. When someone walks in our door, there is no doubt at all that we are decidedly Catholic. Our living room looks more like a chapel than a fashionable American home. When someone visits, potential conversation starters surround him. Some people are edified and find the opportunity for a deeper discussion involving the Faith. Others visit one time and never return. Still others, like my brother and sister who have both left the Church, pretend none of these things exist and try to keep the conversation “neutral.” For all of them, we try to provide an Occasion of Grace. If they choose to ignore it or run from it, there is little more we can do except to pray for them and look for future opportunities to present the Faith to them. For many years before we moved to Central Wisconsin, my wife and I were very active members of our local Traditional Chapel. I served on its board of directors for about fifteen years. My wife and children performed countless, beneficent services for the chapel and its members. Soon after we came to the chapel, we also became friends of St. Benedict Center. We quickly found that the vast majority of the people had been already turned against the Center. Furthermore, nearly all of them, in one way or another, denied the salvation dogma, Extra Ecclesiam nulla salus, and rendered its challenge meaningless. We realized that we were vastly outnumbered. Although it would have sounded good when telling the story to our grandchildren, it was not practical to wade in like St. George and fail valiantly while trying to slay the Dragon. We had no real choice but to get to work cleaning the barn, so to speak. Thus, our approach became the very slow and patient one of proving ourselves as dependable and stable chapel members. The person who introduced us to the St. Benedict Center, also instituted and led our first Circle of Studies group. Under his guidance, we learned more about our Faith, picked up the practical aspects of how to run a Circle group and studied how to defend the salvation dogma. Over time, we invited influential chapel members to join our study group. Some stayed; some did not. Many of those who did not stay were still influenced favorably towards the Center. Although they may not have become “friends” of the Center, they usually ceased their open attacks on the Center and the salvation dogma. Most importantly, the members of the chapel learned that they could trust us. We were dependable and could be counted on to help with the various chapel projects. When the question of The Dogma or Baptism arose (which it did frequently!) we would defend it and answer objections. However, in our conversations and discussions, we never led with the salvation dogma. We allowed it to arise spontaneously. After about ten years, the majority of the people who were formerly critical of the Center and the Dogma, had become quite friendly. Some have even become good friends of the Center. At the time we had an independent priest and we followed the same approach with him. After a number of years, through Our Lady’s intercession, he began to preach the dogma and water Baptism. At home it’s easy to make a display of our Catholic Faith. At work, things are a little more challenging. For many years, we owned our own business. In that context, presenting the challenge of the Faith was relatively easy in that we weren’t faced with discipline or firing for our efforts. We could display religious items in the office without fear of any major reprisal. The worst that happened is that we might lose a lucrative account. About ten years ago, Our Lady decided she had other plans for us and we were forced to close the business because of a sudden and unexpected health problem that I suffered at the time. For a number of years, I have worked as a supervisor for a division of the local State government. Besides being the very last place on earth I thought I would be employed, it has been much more challenging in terms of conducting an apostolate as a Third Order member. In fact, one could say that I am smack dab in the middle of “enemy territory.” For instance, there are work rules that expressly prohibit the display of any religious artifacts in the work area as well as pins or medals that are worn on one’s clothing. Other rules prohibit anything that could be considered as proselytizing. As a supervisor, I suffer from a sort of double jeopardy. I am not represented by a union and I am subject to additional rules governing the “harassment” of my employees. Needless to say, as a Third Order member, I have had to learn to adapt to my new circumstances. I try to follow Christ’s admonition to be as “wily as serpents but as simple as doves.” Unfortunately, because of my fallen nature, I am much better at following the first part of Christ’s command. As anyone who knows me will quickly affirm, I am anything but simple. I work at getting better, but I have a long, long way to go. With that in mind, what follows are some of the adaptations I have made, along with their results. The State allows its employees to display some personal items, including photos of family members. Thus, prominently displayed on my desk are photos of our daughter and her family of ten children as well as photos of our other daughter who answered Our Lady’s call to become Sister Marie Thérèse-a Slave of the Immaculate Heart of Mary. When people enter my office and see the photo of Sister in full habit, guess what becomes the topic of conversation? Well….Imagine that! I didn’t proselytize. I didn’t “push religion” but there it is, nonetheless. I have also displayed photos of the inside of our home. And, guess what people see? They see statues and holy cards and beautiful paintings of Our Lady and the saints. Without violating any of the rules, I try to make the topic of religion hard to avoid. Because I supervise several sites, I have to drag around various files and papers. Within this eclectic stack, I usually include copies of The Housetops or other traditional Catholic periodicals (just for my own personal reading, of course!). The stack is placed in various locations as I travel. Although I don’t make a special effort to do this, Our Lady sees to it that, from time-to-time, these magazines are prominently displayed at the top of the heap. For example, this past week, I had called an employee into my office to discuss a work-related matter. Right in front of her was a copy of The Housetops showing the side featuring the “Prayer for the Conversion of America.” I left it on my desk in front of her, while I made some phone calls on her behalf. She didn’t say anything, but I could see that she was looking at it intently. I am not sure what will happen next. Our Lady has her own timetable. I will wait and watch for an opportunity. And this thought brings me to another adaptation I’ve made to accommodate my current work environment. Because of the work rules that prohibit proselytizing, I have to be careful how I talk about the topic of religion to anyone while I am at work. This is particularly true when I talk to my employees. Normally, I cannot be too direct. I have to be on the lookout for opportunities to broach the topic of the Faith. Pictures and magazines simply make these opportunities more likely. I found that I have to “watch and pray” as it says in Holy Scripture. Speaking of the direct and indirect approaches, my wife and I have changed our tactics quite a bit over the years. In the beginning, we were much more direct with almost everyone. I was particularly guilty of this in our Circle meetings. I thought that a hard-fought, intellectual debate was the way to “win” someone over to the Traditionalist camp. We soon learned that, with a few exceptions, this is not the most effective way to gain friends for the Center nor to win people to the Faith. We not only learned this first hand, but watched the same result in others. We have friends who were converts themselves and, in their zeal, tried this direct approach on their spouses. They were convinced that the best way to effect a conversion was to hammer away at the other until he or she “gave in.” Unfortunately, they drove their spouses to distraction, opening up every kind of emotional wound. The result was that the unconverted spouses dug in their heels and refused to budge. They now live in divided households that are hellish at best with children who are caught in the middle of the battle. The direct approach may be required for brief encounters or when there is some urgency. For example, the Slaves of the Immaculate Heart of Mary use this in their book selling apostolate. We are also direct when someone of another faith is openly trying to proselytize us. However, when it appears that a relationship will be long-term, we have learned to be more circumspect and speak more by example than by wearing someone down with intellectual arguments. We attempt to emulate Brother Francis who is the consummate diplomat under such circumstances. It has been our experience that, whenever possible, we are more effective if we take the time to gain a person’s trust before engaging in serious discussions about the Faith. Needless to say, this requires a lot of patience-something I have little of naturally but have had to learn out of necessity. It also means that we always do our best to act in a manner that will reflect well on the Catholic Church and on the Center. This has been difficult, for me especially. It’s a whole lot more fun to whip someone soundly in a knockdown, drag-out argument than to give a good example! My wife has a similar situation where she works. Thus, by trial and error, we have developed something like a “little way” for winning converts and friends for the Center. It’s not very dramatic, but it seems to work pretty well in our circumstances. Having learned to be more patient has been essential for me to live as a Third Order member on my job. As I said before, according to the State’s work rules, I wouldn’t have a job for long if I stirred things up needlessly. Therefore, in addition to creating occasions for discussions by displaying personal pictures, magazines, and so on, I look for any and all other opportunities to discuss the Faith during the work day. First, I try to build a bond with my employees and my colleagues. Happily, as part of my job, I must directly communicate with my employees for a prescribed minimum amount of time each week. I’ve found that a good time for this is while they are eating lunch. If people are in the lunchroom, I stop by and visit with them informally while they eat. I ask a lot of questions and get them talking about themselves, their homes and their families. I listen carefully for phrases or references that give me an opening to probe further. If I hear anything that hints that they may have been raised as a Catholic, I will gently ask them about it. They usually volunteer whether they still practice the Faith or whether they have fallen away. In this way, I soon find out whether they are something other than Catholic and what that something might be. If the employee is a female, I exercise one important caution. I am very careful to avoid getting too involved in their personal or family problems. It’s too easy for these topics to get off track and become personal in an unhealthy way. My wife exercises the same caution where she is employed. I question them about their hobbies and interests. I will often share news and magazine articles and other tidbits of information concerning their favorite topics. Even if I know little about the subject, my willingness to bring things to them shows that I am interested in them personally. Whenever possible, I include something from a good Catholic source. I work at building rapport while gently inserting references to the Faith or quoting from Catholic sources. If I get any resistance, I immediately back off and wait for another, more opportune time. Once I know a fair amount about the person’s background and attitudes, I watch carefully for ways to introduce the Faith. If they regularly attend the Novus Ordo, I look for opportunities to discuss the Traditional Movement or St. Benedict Center. I may hint at the salvation dogma or I may state it openly depending upon the level of trust and understanding I have gained with the person. I know the strong reaction it evokes the first time someone hears it, so I try to wait until he looks to me as a credible source of information on a variety of topics. The other thing I do is to pray for my associates, my employees, and myself. Every day I begin by asking St. Joseph to help me to be a good and holy supervisor-one who is most like himself. I beg his assistance to help me make wise and prudent decisions and to always act as a good example to those around me. Frequently, throughout the day I say the Hail Mary for my employees, particularly if I see they are struggling with something or having a bad day. I beg Our Lady to help me to say the right things to the people I encounter. While I speak to them, I pray for the person and for guidance. I also pick out people at random, including various customers, and pray for them. One day it struck me that my little prayer may be the only one that person has ever received in his entire life. I figure that it doesn’t hurt to raise the general level of prayer in the workplace. Presently, I’ll give a couple of examples of how I use these techniques in my work environment. After transferring to a different area of the State, I discovered that one of my employees, a man approximately my age, is an amateur creative writer and poet. I expressed a keen interest in his work and have read everything he has written. I shared some articles I have done and we have developed a very friendly relationship. I found out that he is a practicing Catholic; he is a virtuous man and he has a devotion to Our Lady. I also found that, as a poet, he thinks about things deeply. However, like so many modern Catholics, his Faith was weakened when he went to college, where it was undermined at every turn. While there, he met and married a charming and beautiful woman from India. Unfortunately, she is a Hindu. Although we were friendly, I was somewhat stymied as to how to broach the topic of the need for his wife to convert to the Faith. As I said, I continually look for opportunities to share something from a good Catholic author. One day, after a discussion concerning the condition of our modern civilization, I gave him a quote from Hilaire Belloc. He liked it a great deal but we didn’t have a chance to talk for a while. A couple of weeks later, I found that he had begun to do his own research on Belloc–the author, patriot and devout Catholic. He was very excited by what he found. He loved Belloc’s straightforward, unabashedly Catholic style. One day he showed up at my office door and asked if I had some time to talk after we closed our office for the day. Since I make it a practice to be available at all times to my employees, I welcomed him to stay. That night, he produced a book that he said he had been reading and he wanted to know if I had ever heard of it. From his satchel, he produced Belloc’s book entitled The Jews. He asked what I thought of it. Rather than give an opinion (I try to be “wily as a serpent.” Remember? ), I asked him to share his opinion of it. He enthusiastically replied that he had never read anything like it before and it was very exciting. It certainly did not match what was being preached from the pulpit nowadays, but did seem to fit what he had been taught years before in grade school. Needless to say, I saw this as a major breakthrough! To make this long story short, I began to share many things with him and visa versa. I brought traditional prayers and novenas. I brought Green Scapulars for his family members, which now include two beautiful children. I brought original materials I had on the Jews and on Church history. He did more research on his own–at the library and on the internet. He started a debate with some Jehovah’s Witnesses who had stopped by his house. He obtained some materials from Karl Keating’s outfit to help him with his arguments. One day he announced that he had gone on the internet and discovered Keating’s article attacking the St. Benedict Center. He decided to link to the Center’s web site and read what they had to say in response. To his amazement, he found that he agreed with the Center. How could anyone find fault with their position? This gave me the opportunity to give him The Bread of Life and the Father Feeny Omnibus (remember his interest in poetry), along with some copies of The Housetops. He loved everything he read. In fact, he now subscribes to The Housetops and has begun to share it with others. Before I gave him these materials, although I had mentioned the salvation dogma, I did not state directly that his wife needed to become Catholic in order to save her soul. He did not bring it up, so I waited for the right opportunity and followed what the brothers and sisters do when they go book selling. I let the written materials do the work. One day, after having read the Center materials I provided, he announced that he realized that his wife needed to come into the Church in order to be saved. Since then, we have had many discussions on how to help Our Lady make this a reality. He is currently praying novenas and the daily Rosary and very gently urges her to consider becoming a Catholic. He still attends the local Novus Ordo Mass, because the nearest Tridentine Masses are quite a distance from his home. However, not too long ago, he made the extra effort and convinced his wife to take the entire family to the Indult Mass. He loved it and his wife was impressed. Needless to say, there is still work to be done. For perspective, the process I have just described has taken about three years. Like I said before, it requires a lot of patience! In turn, when this man has asked me for suggestions for ways to convert his wife, I refer to the methods I used while I worked with him to become a better Catholic-prayer, patience and making the use of opportunities as they arise. One thing I have done is to ask interested employees to pray for one-another and for me. I hope to increase the holiness of the entire work environment. When one of the employees tells me privately that he is experiencing some personal difficulty, I usually end the conversation by saying simply that I will pray for him. I ask any interested employees to pray for him also. For this purpose, I’m not too concerned whether they’re Catholic or not. I know that God hears all prayers and I am confident that He will answer theirs by giving them Actual Graces to bring them closer to the True Faith. Where I am currently stationed, I have discovered that there are many people who are former Catholics. Thus, I have made a special effort to try and influence these people. Last summer a woman who worked for an agency that is housed in the same building as the one we occupy, discovered that her position was eliminated. Much to her chagrin, she would soon be out of a job. Because we share a common lunchroom, I had spoken to her on several occasions. She expressed her anxiety over the sudden prospect of having to look for a different job considering that she is over fifty years old and living on her own. In our brief conversations, she seemed like a very gentle and simple person. She didn’t have the hardness I noticed in some middle-aged women who, for one reason or another, are now living on their own. Because this lady was being forced to leave very suddenly, I took a very direct approach. I went over to her office and bluntly asked if she was a Catholic and offered her a miraculous medal and a novena prayer to St. Jude. To my relief, she replied she was a Catholic and very much appreciated the items. A week or so later, she stopped at my office to say “goodbye” and to let me know she had located another job. She thanked me for the medal, which she proudly pulled out of her pocket. She also explained that she had been saying the prayer to St. Jude. In fact, she said it was one of her mother’s favorites. She left and, although I said some prayers for her at the time, I was quickly occupied with other concerns. After she had been working a few weeks, I visited with her while she was in the lunchroom, as I do with all my employees. I found that she, like so many others, was actually a fallen-away Catholic-a Catholic in name only. She had lived a very disordered life, full of setbacks and difficulties. Yet, for a middle-aged woman who had many reasons to be bitter, her manner seemed simple and straightforward. Following the approach I explained before, I began to gently broach the topic of the Faith. She mentioned that her mother was still living, though her father had died when she was very young. Her mother had never remarried and the lady considered her mother to be quite saintly. In fact, her mother prayed the daily Rosary for the conversion and protection of her children. When I heard that, I was thrilled! I was certain that Our Lady must have been working very hard to help this woman back into the Church. With this new and very reassuring information, I was absolutely confident that the Blessed Mother would help me. So I went out on a limb. Despite all of the rules and restrictions, and after I had appealed to Our Lady for help, I invited my new employee to have a short discussion about the Faith. Before I began, I carefully explained that she could stop me at any time and that she was free to leave whenever she wished. She seemed genuinely interested and agreed to allow me to continue. To establish rapport, I told how my wife and I had been away from the Church for many years, how we returned and how our lives have been so much better since our return. She replied that she had not been to the sacraments since she was a young girl-more than forty years before. I ended by stressing the necessity of doing what her dear mother wanted for her-to return to the Church, beginning with a general confession. Everything was OK until I got to the part about a general confession. At this point she got a little upset, raised many objections and told of the trauma she suffered in the confessional as a little girl, and so on. I figured I had gone about as far as I could so I brought things to a close. Some time later, I again saw her in the lunchroom and I asked if she would mind if I brought her some Catholic items. She agreed that would be OK. I delivered some holy cards, medals and a rosary. I loaned her a small book on Our Lady of Fatima. A couple of weeks later, I gave her a good Catholic pamphlet on making a general confession. Although she said she had begun to pray the Rosary, she suddenly became hesitant about talking about the Faith, so I pulled back completely. I was worried that I had pushed too fast and too hard. During this time, I had to assign her to work at one of my stations in a nearby city. I was able to arrange for her to travel with the employee (the poet) whom I described above. Before they traveled, I told each of them, separately, that the other person would not be offended if they talked about the Faith. (Obviously, I’m not above some manipulation when I think it will assist Our Lady’s cause!) I heard back from each of them about the wonderful conversations they had about the Faith. I asked the gentleman to help Our Blessed Mother by praying for her conversion. For about the next two months, I didn’t have much of an opportunity to talk to the woman because she was moving from station to station due to our operational needs at the time. Also, I was wary because of her strong reaction to the mention of making a general confession. The day we returned to work after the Memorial Holiday weekend, she approached me and asked if I had a few moments. She excitedly announced that she had made her general confession the previous Saturday. She said that she was ecstatic and, for the first time in more than forty years had begun to pray and gain indulgences. She rejoiced in the fact that she had received Holy Communion worthily for the first time in decades. She had gone to Mass and received communion every day since her confession. .
She said something else that I thought was significant. Although she is very poor, she was very careful to dress in a particular manner each day of the long weekend. On Saturday, she said she wore her only white dress–a business suit–to receive her second “first” communion. The next day was Pentecost Sunday, so she wore red to be consonant with the Church’s season of celebration. On Monday, Memorial Day, she wore red, white and blue to honor our slain veterans. She felt it was very important to dress in a manner that was both formal and expressed the sense of what was taking place in the Church and in her soul. I immediately encouraged her to pray for her family members and those close to her who had strayed from the Faith. Whenever someone has returned to the Faith, I immediately suggest he begin to pray for the people in his family who need spiritual help. I provided her with pamphlets and medals for her family members. Since then, she reported that she has given them to her relatives and wants to help them return to the Church with her. She said she wants them to share in her joy. She continues to go to the Mass and receive the sacraments. She prays the daily Rosary. Recently, to her mother’s delight, she began to join her in praying the Rosary several nights per week. By the time you hear this, this woman’s tenure with us will be finished and she will have moved on to another job in a different state. Her situation raises a difficult question that does not seem to have a pat answer. While it is true that she has returned to the Church, she attends the new Mass. I mentioned the Latin Mass to her one time and her response told me that she has no idea about the problems with the post-Vatican II Church. As I said before, she seems to be a simple person. It is clear that I will not have the opportunity to discuss the next step-the need to become a traditional Catholic and attend the Tridentine Mass and sacraments. Obviously, Our Lady has other plans. So, I have resigned myself to continue to pray for this woman and rely on Our Lady to do the rest. My family and I attend only the Tridentine Mass and sacraments and we have serious reservations about the Novus Ordo. However, we also understand that, as it was originally promulgated, the Novus Ordo is a valid Mass. I have consulted Brother Francis concerning the problem of “which Church” we are to direct people to — one with the traditional Mass or one with the Novus Ordo. Clearly, we often have no control over what will happen. As in this particular case, the nearest traditional Mass is many miles away. For this woman, who has limited access to transportation, it does not appear to be a viable option at this time. It is not even a choice that she has seriously entertained. Brother explained that we have to leave it to Our Lord and Our Lady to provide for these people. Here is where we must recall that our Third Order apostolate is the work of Our Lady. It is not our own little project and we are not in charge. She will provide whatever means are necessary for people to save their souls, if they sincerely cooperate with God’s grace. In Our Lady’s plan for their salvation, we can only perform the little part she has given us and trust that she will find another means of accomplishing the rest without us. What we can do is to continue to pray that they will persevere, continue to cooperate with God’s grace and merit the means to save their souls. I have talked to other employees of mine about the Faith. Three people in particular are fallen-away Catholics and, although they are very kind and generous people, they are very cynical about the Church. When I’ve approached them, they’ve gotten very upset, so I’ve backed off. When one of them was about to have a serious surgery, I gave him a Miraculous Medal. A few days later, he stopped by and sincerely thanked me for it, but clearly did not want any conversation. I continue to pray for them and am waiting for some opportunity. I have also asked the two employees I described above to pray for them as well. At the start of the year, a lady transferred from another area of the State. She was very frustrated because she and her husband were having difficulty selling their home. I found out that she is Catholic and gave her both a Miraculous Medal and a copy of the Novena of Childlike Confidence. A few days later she excitedly announced that she had recited the novena and her prayers were answered. After a couple of months of inactivity, suddenly they had an offer on the house and it sold quickly. For several years I did not have much of a chance to talk further about the Faith with her or her husband. This past Fall, she contracted a very serious cancer and I took the opportunity to give her many Catholic sacramentals, books, and holy cards. I have met with her at her home and gently explained the need to return to the Faith. She was very receptive, but I do not know for certain if she has returned to the Church. I asked her fellow employees (whether they are Catholic or not) to pray for her and I’ve made it clear to her that they are doing so. One of her co-workers has already made the fifty-four day rosary novena for her cure and, most importantly, for her conversion. Only God knows what will happen next, but, with Our Lady’s help, I will continue to work and pray for her conversion. This is what I mean about our “little” way of living as Third Order members. We usually work one-on-one. We try to build trust. We look for little, every day opportunities to discuss the Faith. We try to create an atmosphere that will encourage such discussions. We pray a lot. We are not afraid to use some manipulation when it seems warranted. We do not shy away from the salvation dogma, but neither do we usually lead with it. (There are many exceptions to this, which I will not have the time to mention in today’s talk.) We share Catholic literature, medals, holy cards, and prayers whenever possible. In short, we keep cleaning the stable, polishing the armor, and sharpening the sword, knowing that Our Lady will send the Dragon to us when the time is right. Although I described some apparent successes, I would not be surprised if, tomorrow, any or all of these folks either turned on us or fell away from the Faith. Free will can be that way. It’s happened many times before. Certainly, the devil is going to redouble his efforts to win them back. In fact, I just reviewed what I have written so far and I’m afraid that it sounds too good to be true. Actually, it sounds way too glib and glossy! I have not conveyed the daily grind of it all-the difficulties-the frustrations. That it’s one tiny step forward and a thousand backward. Sometimes it’s years of struggle with one person and, when success seems to have arrived, the whole thing suddenly comes crashing down. After years and years of discussion, argument and visiting, a close relative seemed to be making wonderful headway in the Faith. Over the years, he and his wife grew more and more enthusiastic. They wanted to start a Circle of studies group in their home. Some problems developed between him and his wife, but the difficulties didn’t seem to be overwhelming. To help himself to become a better spouse and father, my relative attended a traditional retreat in Winona. He returned with a strengthened devotional life. He was convinced that the Tridentine Mass was the only real choice for him and his family. He seemed all on fire. Then, without warning, the whole thing was smashed to pieces when his wife served divorce papers on him. After countless visits, encouragements, prayers, counselings, they not only divorced but they both dropped the Faith completely. Their family is destroyed. Their children seem irretrievably lost. My relative has “remarried” and announced he is now a Lutheran. After what seemed to be such a wonderful advancement, their family is now a hideous, horrible tangled mess. Only God knows what will come of it. Since they no longer want much to do with us, I can only pray for a miracle. Earlier, when the examples sounded like some wonderful fairy tale of people converting to the Faith and living happily ever after, that was not exactly true to life. It’s very hard to convey the reality of it all. While the examples I gave are true, we really don’t have much to show for more than twenty years of living as Third Order members in the world. My wife and I constantly make mistakes. We overreact; we under react. Although I pray that I will always be a good example, the reality is something very different. God only knows how many people I have scandalized and caused to lose the Faith or to look in another direction. My day is filled with temptations and trials. I am inconstant and I fail more frequently than not. I’m neglectful. I forget. I get distracted. I get caught up in my own little problems. Just because I happen to be the person who composed this lecture, please do not get the idea that my wife and I are anything special to the crusade. Like I said in the beginning, we just plug along day-by-day. We pray. We work. We try to influence. We struggle. And, mostly, we fail. It is very easy to become discouraged. Yet, precisely because of all this, we know without any doubt in the world that this is Our Lady’s work. She picks us up and keeps us going. She is the only reason that we are not on a straight path to hell. She has protected countless people from our mistakes and turned some of our greatest blunders into success. Every day it is the same-one tiny step forward and a thousand backward–one little reward and countless disappointments. We are wretched instruments. It is her struggle. It is her crusade. It is her love for us that keeps us going. God willing we will never forget that! With the full realization that we will experience more difficulties than successes, we try to make it a practice to offer Our Lady all of our trials, setbacks and temptations. However, the sad truth is that we usually forget. Often it isn’t until the crisis is over that we realize that we’ve neglected to offer it up. Even after years of practice, we still forget more often than not. While it may appear mundane, living in the world as a Third Order member is anything but. Every day is a challenge. If it were easy, we’d probably have all the cafeteria Catholics of the world doing this with us! As Father Feeney once said: Once we accept and profess the dogma Extra Ecclesiam nulla salus, hair shirts will be provided. All I can say to that is “Amen!” As anyone in the crusade soon discovers, just getting through the day can be a heroic endeavor. None of this is new. To one degree or another, all of us are doing the same thing-working to try to rebuild the Church, one soul at a time. I pray that you continue your beautiful apostolate as Tertiaries of the Slaves of the Immaculate Heart of Mary. Despite the difficulties, temptations, and setbacks, there is no more noble vocation in the world than the daily struggle to do the will of Our Blessed Mother. My wife and I ask for your prayers so that we will be able to continue to live as faithful Third Order members. You can be assured that every day we pray for all of you. When we need encouragement we look to Brother Francis and Sr. Mary Bernadette. The brothers and sisters of the St. Benedict Center are the only modern Catholic religious I know of who consider each, individual human soul as something to be concerned about. They sit up at night losing sleep over the fate of a student in the school as much as they worry about the conversion of their nation and the restoration of the Church. Their grand scheme is as lofty as eternity and as mundane as every person with whom they come in contact. As Third Order members living in the world, I believe we must try to reflect this same attitude to the best of our God-given abilities. O Mary, Refuge of Sinners, pray for us!